1.) Goto https://estimaterocketapi.com/ and login with your Estimate Rocket account owner login - this will give you access to the Estimate Rocket API. 2.) Next login to your Zapier account, (if you don't have one yet, you will need to sign up for a Zapier "Starter" account in order to use Quick Books Online: https://zapier.com/pricing/) Zapier can also be used to sync with other 3rd party services as well. 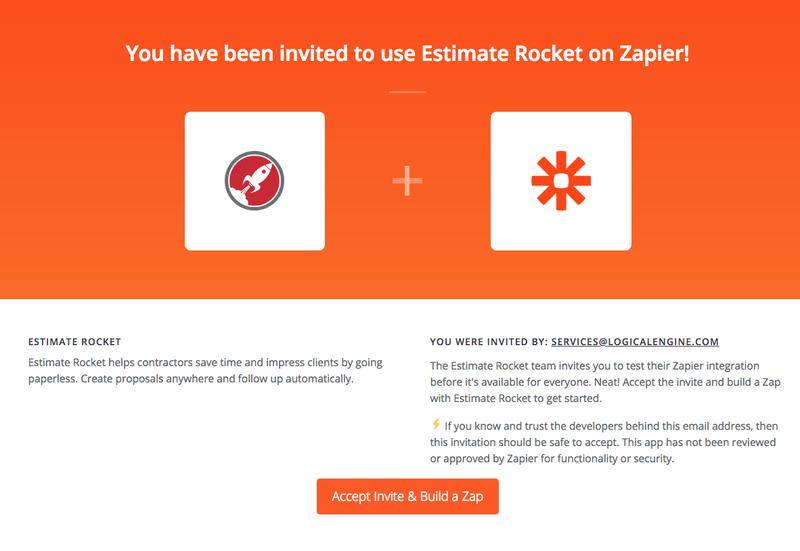 When the confirmation dialog appears, click Accept Invite & Build a Zap, this will connect Estimate Rocket to your Zapier Account. Once finished you can begin creating zaps and start sending information to other applications.